Methinks it's time to call in the Texas Rangers to sort this mess out. Too many mix-up'S & messed up'S from what we've heard. A mother reporting her cancer stricken daughter for drug use sounds like "Swatting" to me. Ah, the therapeutic properties of the devil's dandruff. The weed, possibly. The coke, nope. Best to wait until all the investigations are done and then speculate. 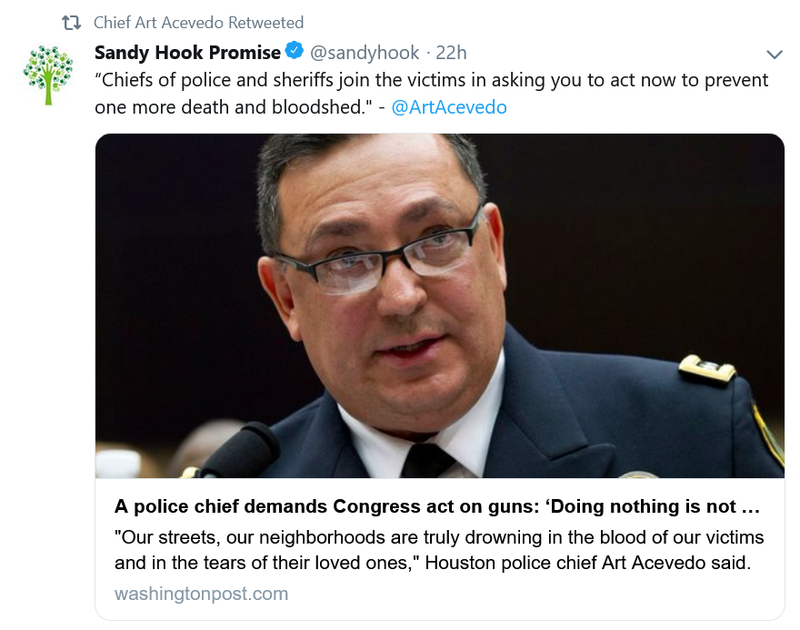 While pretending to be hard at work investigating this incident, Acevedo finds the time to push gun control in the U.S. Capitol and on his Twitter feed. Why does Acevedo still have a job? First we heard there was no video-tape of the incident then Acevedo said they are reviewing body-cams....hmmmm. I am certain this had to be recorded both audio and video. Acevedo needs to release it all to the public if he truly believes in "transparency." He could certainly redact any portions deemed confidential such as informant names, if mentioned, etc. Glad I do not live in Houston anymore. Sheriff Scott Israel helped create the catastrophe at Parkland, and shifted blame to the NRA and US Constitution. The same reason Daniel Ortega still has a job. More questions, no answers. A cover up, I do smell. No 9mm, no 357 revolver was at home at time of the raid. Wait, there was no .357 or 9mm found at the house. So all this time I was trying to figure out how the homeowner was so good that he wounded 4 with a six shot revolver, instead he was most likely firing a shot gun. Why did they say handgun, when there wasn’t one. Was it because every drug dealer has a handgun? Proper investigations take time. And, they're not run by the chief of police. A middle aged married couple were killed and five cops were injured. Methinks if TPTB in Houston cared about the truth they would have called in the Rangers two weeks ago. Apparently the 2 CIs have said that they never said anything about heroin or don't recall seeing heroin, and that they didn't recognize the people in the house. Sounds like they hit the wrong house and murdered Innocents.